On September 7, 2013 His All-Holiness Ecumenical Patriarch Bartholomew visited the Holy Cathedral of St. Symeon in Tallinn, Estonia. Early that afternoon, His All-Holiness presided over Vespers Service in the same church, at which time he delivered the Homily. Below is an excerpt of this Homily, in which he addressed the topic of the relationship between Church and Family, and in turn condemned Homosexual Marriage as an innovation foreign to the ecclesiological mindset and Christian way of life. The Church, my beloved parents and children, and subsequently the family, which consists lawfully and by the command of God of men and women, and the children acquired, is not a foundation or association or a simple organization, but a Body, as it is wonderfully depicted by the Apostle Paul. And this parallelism is accurate and true. Church and marriage. Husband and wife. Body and its members. This community, signified in the Mysteries and in the obedience of Faith, both in the Church and in the family, is sanctified and mystagogued through the Mystery of Marriage, which, according to the Fathers, is a mystery of co-creation, and the ontological link of love with the Head of the Body, to ensure health and life, which is salvation and sanctification. 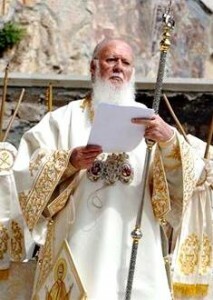 As in our Orthodox Church, where no member is forgiven to deal with things in a peculiar form and at one’s discretion and to prey on the proper operation and sincere communion of the love and unity of faith of the other members, or despise and ignore them, because they create cancerous disorders, agitations, dissensions, schisms, and heresies. This applies as well to the miniature church, the family, in which is required compassion, love and unity for the structure to be built, in which the father, the mother and the children have a place inter-embracing one another’s gifts, responsibilities and rights, and they are “individually members of it”. God blesses our every effort towards the fulfillment of His will, and every struggle in life, according to one’s faithfulness in each and every talent. “exchanged the truth about God for a lie, and worshiped and served created things rather than the Creator — who is forever praised” (Romans 1:24-26). “females exchanged natural sexual relations for unnatural ones. In the same way the men also abandoned natural relations with women and were inflamed with lust for one another. Men committed shameful acts with other men, and received in themselves the due penalty for their error” (Romans 1:26-28). Let this not also be born in you, Orthodox Estonians, brethren and children.